So far all the sparkly guitars of Sparkly Guitar Week have been single examples, but Gretsch has championed the cause of the sparkly guitar so thoroughly that I’m just gonna cite them generally. Pictured is a Sparkle Jet (photo originally from guitarsandeffects.com). This model is still available today, although they’re certainly not the most common Gretsch on the racks. CLICK HERE to see the page for this model and colour (somewhat unsubtly titled ‘green sparkle’ on the official Gretsch website. Another notable and highly visible Gretsch is the Silver Jet model used by KT Tunstall. KT’s Silver Jet has a different bridge than the Bigsby unit that comes standard on the current Gretsch model, (which is based on the early 60s version of the Silver Jet) but the vibe is still very much there, as is the sparkle. CLICK HERE to see the page for the Silver Jet on the Gretsch website. 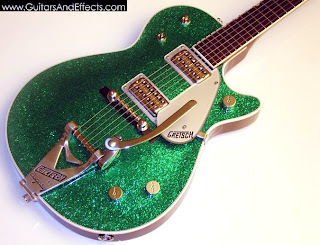 And here are a bunch of cool sparkly Gretsches available on Musician’s Friend. Dig that crazy sparkly baritone!